Sorry Folks I didn't make it over last week, family things to deal with and visiting my grandaughter in hospital, after a real scare last week she is now beginning to make some progress, so we are praying this continues, bless her. 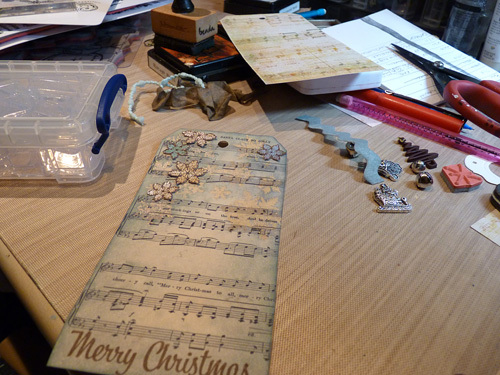 For me my desk is scattered with bits and pieces, I am well and truly into Christmas and tags as you can probably see. The photos were taken last night under spotlights, hence the shadows and strange lighting. Why do I always seem to work in such a small space and have so many bits and pieces around me? Answers on a postcard please lol. This is my next tag under construction, so far weathered wood and vintage photo and some embossing resist. A selection of embellishments collected together to use too. Hopefully this should be posted tonight or tomorrow morning. OK so what is your desk like today? Pop on over to The Stamping Ground and Julia's lovely blog and be transported all around the world taking a peek at creative spaces in so many countries. I will be around later today to link this and start my travels. Like many of you I visit all those ending with the same number as me and more, particularly people I already know and those who leave me a comment. Thanks for taking the time if you do. Have a great day and enjoy your crafty ventures. I hope your granddaughter will recover quickly!The tag on your desk looks promising! Hoping your granddaughter continues to improve really well Brenda. Can't wait to see the finished tag as the background looks fabulous. I recognize this way of working Brenda...great to see others work the same way...hope your granddaughter continues improving...when you mail me her address I'll send her a card (if you thinks she likes that)...enjoy your day! Dear Brenda, I have no answer to your problem as I have the same problem on a larger scale. (This is because I was born with a small tidy gene.) So glad that your granddaughter is doing well. Hope all goes well with your granddaughter. Your tag looks brilliant and I look forward to seeing it complete. Hope your granddaughter will recover soon. The work on your desk loogs very great and beautiful. Your desk looks great and your tag awesome. GREAT news that your granddaughter is starting to make real progress too. Oh, I love your tag!!! My table that I work on is round so I really have to watch how I move things around - otherwise it goes right over the edge! 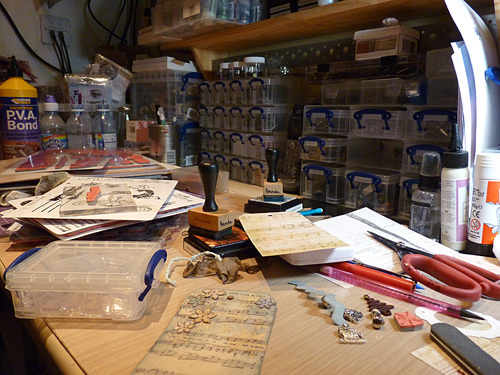 I usually manage a space about two feet square to craft on. We all seem to make the most use of our space! Oh, your granddaughter has had a rough time! I do hope things improve quickly. Hard to find the mojo when things like this happen, never mind keep things tidy! I hope your Grand daughter continues to improve, Brenda. It must be very hard on everyone. My thoughts are with you. I like the look of your lighting on your desk full of lovliness. That tag is looking gorgeous. I shall look forward to seeing how it turns out with all your embellies. Aw Brenda, I too hold your granddaughter in my thoughts and wish her real huge doses of that childhood 'bounce back' that we all talk about, bless her indeed. Your desk looks gorgeous to me..and aren't you clever, looks as if you know exactly what's going on the tag..the e bellies at right are looking good! A very creative place, looking forward to the completed tag. Ah well... you see with going backwards through Blogger dashboard to catch up with visits, I already know that that tag is going to be gorgeous! Belated happy WOYWW! I hope your gd continues to improve. I'm all about Christmas too so love your desk this week. Progress, YES! So glad to hear it! Good luck to your grandee for a quick recovery! Love the look of your desk and all it's organisation resulting in a tag that's going to be perfect! Love the look of that tag...fantastic! Love the music theme on your C'mas tag. I'm thinking about some music too but I want a particular song so am hand writing the notation. Hmmm. Not sure whether it will work. So sorry to hear about your granddaughter. Had hoped she was way out of those woods. Tell her your pushy NY pal says Get Well Soon! Thanks for your lovely comment, you have some beautiful blogs, I am going to try some of your challenges. I hope your grandaughter recovers quickly.